(1)　OSLO – Part of East Antarctica is more vulnerable than expected to a thaw that could trigger an unstoppable slide of ice into the ocean and raise world sea levels for thousands of years, a study Sunday showed. (2) The Wilkes Basin in East Antarctica, stretching more than 1,000 km (600 miles) inland, has enough ice to raise sea levels by 3 to 4 meters (10-13 feet) if it were to melt as an effect of global warming, the report said. (3) The Wilkes is vulnerable because it is held in place by a small rim of ice, resting on bedrock below sea level by the coast of the frozen continent. That “ice plug” might melt away in coming centuries if ocean waters warm up. (4) “East Antarctica’s Wilkes Basin is like a bottle on a slant. Once uncorked, it empties out,” Matthias Mengel of the Potsdam Institute for Climate Impact Research, lead author of the study in the journal Nature Climate Change, said in a statement. 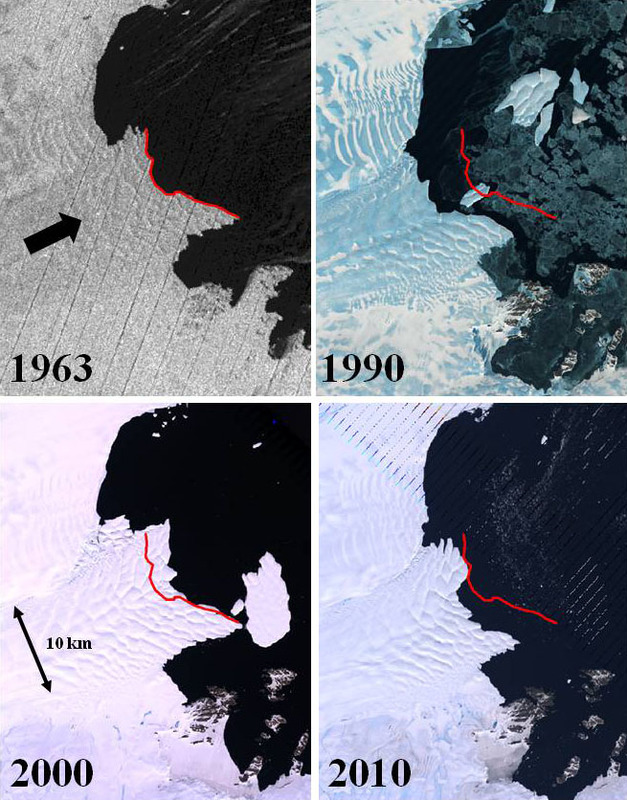 (5) Co-author Anders Levermann, also at Potsdam in Germany, said the main finding was that if set in motion, the ice flow would be irreversible. He said there is still time to limit warming to levels to keep the ice plug in place. (6) Almost 200 governments have promised to work out a U.N. deal by the end of 2015 to curb increasing emissions of man-made greenhouse gases that a U.N. panel says will cause more droughts, heat waves, downpours and rising sea levels. (7) Worries about rising seas that could swamp low-lying areas from Shanghai to Florida focus most on ice in Greenland and West Antarctica, as well as far smaller amounts of ice in mountain ranges from the Himalayas to the Andes. (8) Sunday’s study is among the first to gauge risks in East Antarctica, the biggest wedge of the continent and usually considered stable. “I would not be surprised if this (basin) is more vulnerable than West Antarctica,” Levermann said. (9) Antarctica, the size of the United States and Mexico combined, holds enough ice to raise sea levels by some 57 meters (188 feet) if it ever all melted. (10) The study indicated that it could take 200 years or more to melt the ice plug if ocean temperatures rise. Once removed, it could take between 5,000 and 10,000 years for ice in the Wilkes Basin to empty as gravity pulls the ice seaward. (12) The United Nations panel on climate change says it is at least 95 percent probable that human activities such as burning fossil fuels — rather than natural swings in the climate — are the dominant cause of warming since the 1950s. (13) Sea levels are likely to rise by between 26 and 82 cm (0.85 to 2.7 feet) by the late 21st century, after a rise of 19 cm (0.6 feet) since 1900, it says. Antarctica remains the biggest uncertainty. ①The Wilkes Basin in east Antactica stretches more than 1,000 km inland. basin： ①an open round container shaped like bowl with sloping sides, used for holding food or liquid. ⑤ a shelterd area of deep water where boat are kept. basin: In geography, a basin is particular region of the world where the earth’s surface is lower then in other places. (If it is) once uncorked, it empties out. Worries about rising seas focus most on ice in Greenland and West Antarctica. Japanese travelers were among the casualties. ①Sunday’s study is among the first to gauge risks in East Antarctica, the biggest wedge of the continent and usually considered stable. (East Antarctica was) usually considered stable. A newly released study by scientific researchers finds that the problem of plastic in the ocean is worse than previously believed. The new highly extensive study published last month found that 5.25 trillion pieces of plastic weighing some 269,000 tons have now inundated the oceans, reaching into even the remotest areas. The ships doing the research traveled far more widely than in past studies, collected more samples and used more advanced computer models to analyze the data. The conclusion confirms what has already been known: that the world’s oceans are full of plastic but that the new research indicates that the plastic has expanded and dispersed to a much greater degree than previously believed. The study also examined how the plastic bottles, bags, toys and vast amount of other floating plastic gathers at “gyres,” where ocean currents come together into a massive circular eddy that traps the plastic. At those ocean gyres, the garbage is smashed together by wave action after becoming brittle in the sun. Once the plastic is shredded into pieces as small as grains of sand, it can spread widely. As a result, researchers cannot easily determine where the smallest pieces have gone. One related study found 35,000 tons of plastic in the ocean, but they were expecting to find millions. The plastic didn’t disappear; it just became harder to find as it became more deeply enmeshed in the biosphere. Even more disturbing is the finding that plastic pieces easily become coated with other toxic substances such as PCBs, thereby helping to retain and spread the most poisonous substances. The toxic-coated, poisonous plastic is swept into the ocean’s deepest reaches to be ingested by marine organisms. After ingesting the pollutants and absorbing the toxic substances, the organisms pass them to predators higher in the food chain, where they become increasingly concentrated. Eventually, of course, that plastic reaches humans. Once the plastic enters the food chain, it doesn’t disappear. It works its way up. The current use of plastic materials is ecologically unsustainable. Most estimates show that the vast majority of plastics used by consumers are not recovered or recycled. Plastic that makes its way into the ocean has little chance of ever being recycled. The increasing invasion of plastic into the food chain is not just a matter of sustainability; it is a matter of poisoning the source of all earthly life. Solutions are difficult to come by. One suggestion is that fishing vessels reclaim nets and other plastic fishing equipment, since a great deal of the plastic comes from discarded fishing nets and buoys. It is not just the fishing industry that needs to institute better practices; the entire system of production and consumption of plastic in the world needs to be radically reformed. Controlling the level of plastic in the ocean is an urgent issue that must be addressed before humans start questioning each bite of fish they eat. (1) The government is weighing measures to aid power companies that decommission aging nuclear power plants and host municipalities that will lose nuclear power-related revenue. To facilitate the moves to scrap aging plants, some steps may be necessary to ease the process. But support should not be extended in ways that perpetuate the reliance of the power firms and the host municipalities on nuclear power. (2) Under safety regulations tightened after the March 2011 meltdowns at Tokyo Electric Power Co.’s Fukushima No. 1 nuclear power plant, utilities are not allowed in principle to run nuclear power reactors for longer than 40 years. The operators can seek to extend reactor operations for up to 20 years, but they need to undergo special inspections by the Nuclear Regulation Authority, which would require huge investments to upgrade aging equipment to beef up their safety. (3) Of the 48 nuclear power reactors in Japan, four — the No. 1 reactor at Japan Atomic Power Co.’s Tsuruga plant, the Nos. 1 and 2 reactors at Kansai Electric Power Co.’s Mihama plant and the No. 1 reactor at Chugoku Electric Power Co.’s Shimane plant — have already been in operation for more than 40 years, while three others — Nos. 1 and 2 reactors at Kansai Electric’s Takahama plant and the No. 1 reactor at the Genkai plant of Kyushu Electric Power — will reach the 40-year mark in July 2016. (4) The power firms need to apply to the NRA by next summer if they want to extend the reactors’ operation. The utilities are said to be considering the choice of decommissioning the aging reactors, which typically have small output capacity and are unlikely to churn out profits that match the massive cost of renovation. (5) The government is ready to facilitate the move, apparently on the belief that scrapping aging reactors will help win public support for reactivating other reactors that were put offline after the Fukushima disaster. While urging the power companies to make swift decisions, the government has kicked off discussions on measures to support the moves by the utilities. (6) Decommissioning a nuclear power reactor takes 20 to 30 years. In addition to the direct cost of scrapping the reactor, there will be other expenses such as those for disposing of the large amount of radioactive waste. (7) While the utilities have set aside reserves to pay for future decommissioning by adding the cost on to electricity bills, moving forward schedules for scrapping reactors due to new safety regulations will require additional expenses. The power companies also need to devalue the reactors once they are decommissioned and report the losses. (8) Local governments hosting the nuclear power plants stand to lose national government grants to such municipalities as well as revenue from fixed asset taxes on the reactors to be decommissioned. There are concerns about severe damage to local economies from the cuts of such revenue, along with losses to related businesses. (9) Under discussion at a panel of the trade and industry ministry are measures such as changing accounting rules that currently require the power companies to report losses on the reactors immediately after decommissioning them, as well as maintaining government financial support for the host municipalities even after the reactors have been scrapped. (10) Also reportedly under consideration is a system that will include in the price of electricity generated by nuclear power the total power generation costs — including the expenses of future decommissioning of reactors and disposal of spent fuel — even after the retail sale of power is fully deregulated. (11) The decommissioning of reactors that are aging and more vulnerable to severe accidents or natural disasters should be promoted, and steps will need to be taken to eliminate hurdles, including financial concerns, that deter such moves. But the steps need to be limited to temporary measures that ease the financial burden on the power firms and host municipalities. (12) Preferential treatment toward nuclear power that could encourage the utilities to keep relying on it as a source of commercial electricity, as well as policies that keep the local economies depending on the nuclear power industry, will run counter to the government’s pledge in its latest basic energy plan to reduce “as much as possible” the nation’s reliance on nuclear power, and therefore must be avoided. (7) While/ the utilities have set aside reserves/ to pay for future decommissioning/ by adding the cost on to electricity bills/, moving forward schedules for scrapping reactors due to new safety regulations/ will require additional expenses. The power companies/ also need to devalue the reactors/ once they are decommissioned and report the losses. (8) Local governments hosting the nuclear power plants/ stand to lose national government grants to such municipalities/ as well as revenue from fixed asset taxes on the reactors to be decommissioned. There are concerns about severe damage/ to local economies from the cuts of such revenue/, along with losses to related businesses. (9) Under discussion at a panel of the trade and industry ministry/ are measures such as changing accounting rules/ that currently require the power companies to report losses on the reactors/ immediately after decommissioning them/, as well as maintaining government financial support for the host municipalities/ even after the reactors have been scrapped. (10) Also reportedly under consideration/ is a system that will include in the price of electricity generated by nuclear power the total power generation costs/ — including the expenses of future decommissioning of reactors and disposal of spent fuel/ — even after the retail sale of power is fully deregulated. (11) The decommissioning of reactors/ that are aging and more vulnerable to severe accidents or natural disasters/ should be promoted/, and steps will need to be taken to eliminate hurdles/, including financial concerns/, that deter such moves. But the steps need to be limited to temporary measures/ that ease the financial burden on the power firms and host municipalities. (12) Preferential treatment toward nuclear power/ that could encourage the utilities to keep relying on it as a source of commercial electricity/, as well as policies that keep the local economies depending on the nuclear power industry/, will run counter to the government’s pledge/ in its latest basic energy plan/ to reduce “as much as possible” the nation’s reliance on nuclear power, /and therefore must be avoided. Preferential treatment toward nuclear power/ (that could encourage the utilities to keep relying on it as a source of commercial electricity/, as well as policies that keep the local economies depending on the nuclear power industry/,) will run counter to the government’s pledge in its latest basic energy plan/ to reduce “as much as possible” the nation’s reliance on nuclear power, /and therefore must be avoided. One problem is that journalists have "just checked funds desclosed in Tokyo" without seeing the big picture, Kamiwaki said. A politician is obliged to operate a single body to manage his or her political funds, which theoretically handles all receips and expenses. The Political Funds Control Law obliges a politician to operate a single body to manage his or her political funds. But anyone can set up support groups that will benefit a particular politician, and the politician can also serve as the head of a local chapter of his or her political party. They often do. The Political Funds Control Law does not prevent cash transfers between a politician's fund management body, affiliated support groups, and the party's local chapeter. "If a party receives a political fund subsidy, which is taxpayers' money, there should be (stronger) reguration of the use of political funds by pokiticians," Kamiwaki said. "If they don't want regulations, political fund subsidies shold be abolished instead." (1) Cuba is an impoverished island that remains largely cut off from the world and lies about 4,500 miles from the West African nations where Ebola is spreading at an alarming rate. Yet, having pledged to deploy hundreds of medical professionals to the front lines of the pandemic, Cuba stands to play the most robust role among the nations seeking to contain the virus. (2) Cuba’s contribution is doubtlessly meant at least in part to bolster its beleaguered international standing. Nonetheless, it should be lauded and emulated. (3) The global panic over Ebola has not brought forth an adequate response from the nations with the most to offer. While the United States and several other wealthy countries have been happy to pledge funds, only Cuba and a few nongovernmental organizations are offering what is most needed: medical professionals in the field. (4) Doctors in West Africa desperately need support to establish isolation facilities and mechanisms to detect cases early. More than 400 medical personnel have been infected and about 4,500 patients have died. The virus has shown up in the United States and Europe, raising fears that the epidemic could soon become a global menace. (5) It is a shame that Washington, the chief donor in the fight against Ebola, is diplomatically estranged from Havana, the boldest contributor. In this case the schism has life-or-death consequences, because American and Cuban officials are not equipped to coordinate global efforts at a high level. This should serve as an urgent reminder to the Obama administration that the benefits of moving swiftly to restore diplomatic relations with Cuba far outweigh the drawbacks. (6) The Cuban health care workers will be among the most exposed foreigners, and some could very well contract the virus. The World Health Organization is directing the team of Cuban doctors, but it remains unclear how it would treat and evacuate Cubans who become sick. Transporting quarantined patients requires sophisticated teams and specially configured aircraft. Most insurance companies that provide medical evacuation services have said they will not be flying Ebola patients. (7) Secretary of State John Kerry on Friday praised “the courage of any health care worker who is undertaking this challenge,” and made a brief acknowledgment of Cuba’s response. As a matter of good sense and compassion, the American military, which now has about 550 troops in West Africa, should commit to giving any sick Cuban access to the treatment center the Pentagon built in Monrovia and to assisting with evacuation. (8) The work of these Cuban medics benefits the entire global effort and should be recognized for that. But Obama administration officials have callously declined to say what, if any, support they would give them. (9) The Cuban health sector is aware of the risks of taking on dangerous missions. Cuban doctors assumed the lead role in treating cholera patients in the aftermath of Haiti’s earthquake in 2010. Some returned home sick, and then the island had its first outbreak of cholera in a century. An outbreak of Ebola on the island could pose a far more dangerous risk and increase the odds of a rapid spread in the Western Hemisphere. (10) Cuba has a long tradition of dispatching doctors and nurses to disaster areas abroad. In the aftermath of Hurricane Katrina in 2005, the Cuban government created a quick-reaction medical corps and offered to send doctors to New Orleans. The United States, unsurprisingly, didn’t take Havana up on that offer. Yet officials in Washington seemed thrilled to learn in recent weeks that Cuba had activated the medical teams for missions in Sierra Leone, Liberia and Guinea. (11) With technical support from the World Health Organization, the Cuban government trained 460 doctors and nurses on the stringent precautions that must be taken to treat people with the highly contagious virus. The first group of 165 professionals arrived in Sierra Leone in recent days. José Luis Di Fabio, the World Health Organization’s representative in Havana, said Cuban medics were uniquely suited for the mission because many had already worked in Africa. “Cuba has very competent medical professionals,” said Mr. Di Fabio, who is Uruguayan. Mr. Di Fabiosaid Cuba’s efforts to aid in health emergencies abroad are stymied by the embargo the United States imposes on the island, which struggles to acquire modern equipment and keep medical shelves adequately stocked. (12) In a column published over the weekend in Cuba’s state-run newspaper, Granma, Fidel Castro argued that the United States and Cuba must put aside their differences, if only temporarily, to combat a deadly scourge. He’s absolutely right. Yet, having pledged to deploy hundreds of medical professionals to the front lines of the pandemic, Cuba stands to play the most robust role among the nations seeking to contain the virus. The virus rises fear that ～. (11) With technical support from the World Health Organization, the Cuban government trained 460 doctors and nurses on the stringent precautions that must be taken to treat people with the highly contagious virus. The first group of 165 professionals arrived in Sierra Leone in recent days. José Luis Di Fabio, the World Health Organization’s representative in Havana, said Cuban medics were uniquely suited for the mission because many had already worked in Africa. “Cuba has very competent medical professionals,” said Mr. Di Fabio, who is Uruguayan. Mr. Di Fabio said Cuba’s efforts to aid in health emergencies abroad are stymied by the embargo the United States imposes on the island, which struggles to acquire modern equipment and keep medical shelves adequately stocked. (1) Draft legislation prepared by the administration of Prime Minister Shinzo Abe requires large companies as well as the national and local governments to set and publicly disclose targets for promoting women in their organizations beginning in fiscal 2016. ①　Draft legislation requires A and B to set. ②　Draft legislation requires A and B to publicly disclose targets. (2) The move follows a goal Abe set in his economic growth strategy of raising the ratio of women in leading positions in society to 30 percent by 2020. (3) Members of the business community are said to have resisted setting a uniform target for boosting the ratio of women in management on the grounds that their ability to do so would differ between individual companies and sectors. (4) But the Abe administration reportedly insisted that the bill, which it hopes to get enacted in the current Diet session, will impose legal obligations on the part of businesses and government organizations to make some commitments on promoting female workers. (5) Behind Abe’s 30 percent target and the proposed legislation is a sense of crisis that unless it taps more women to join the labor force, Japan could face a serious shortage in the workforce due to its rapidly aging and declining population, casting doubts over the nation’s future economic growth and sustainability of its social security system. (a sense of crisis) casts doubts over the nation’s future economic growth and sustainability of its social security system. (6) An estimate by the Health, Labor and Welfare Ministry warns that the number of people with jobs could fall by up to 8.2 million by 2030 if women’s labor participation does not increase as expected. If more women join the workforce as hoped for by the government, the margin of decline would be reduced to about 1.7 million, the ministry says. (7) There are mixed views as to whether the legislation would in fact result in visible changes to Japan’s male-dominated corporate culture. Skeptics say the bill lacks teeth because it leaves it up to each company to determine what kind of target to set and what level of goal to aim for, making it unlikely that they would self-impose ambitious goals that radically change the status quo. Still, disclosure of the action plans by the companies with numerical targets for promoting more women to senior positions will expose their behavior to public scrutiny, and businesses with unambitious plans may face difficulties recruiting talented workers, including women. (8) Companies with more than 300 employees will be required to make and disclose plans with targets for the promotion of women and specific ways to achieve them. The government will later set examples on what types of targets should be set by the firms, but they may not necessarily be numerical goals for the ratio of women in management ranks. They will likely include such criteria as the proportion of women in overall hiring and the ratio of workers taking child-care leave. (9) While the national and local governments will come under the same obligations, smaller businesses will only be urged to make such efforts voluntarily. The government will recognize “excellent companies” that have ambitious targets and plans to introduce preferential treatment of such firms in terms of opportunities to get public works contracts. (10) Nearly 30 years after the law mandating equal employment opportunities for men and women was introduced in 1986, women account for just 7.5 percent of management positions in Japanese firms, far lower than the 30 to 40 percent in many other advanced economies. Women accounted for a mere 3 percent of national government employees in management positions as of October 2013, compared with 40 percent in Sweden, 33 percent in the United States and 9 percent in South Korea, according to an annual report by the National Personnel Authority. Women accounted for 26.8 percent of newly hired government workers in fiscal 2013. (11) A top-down approach to promoting women to management positions may be necessary to change the situation. But equally important will be more steady bottom-up efforts to remove obstacles that discourage women from maintaining their career path. According to the labor and welfare ministry, women account for roughly 40 percent of Japan’s workforce, but more than half of them are irregular employees, working part-time or as temporary dispatch staff. (12) About 60 percent of women leave their jobs when they have their first child. The ratio of women in regular full-time employment is the highest in the 25-to-29 age bracket. It then declines after that as many women become irregular workers. Many women quit their jobs because they think it’s too tough to work full-time while raising young children and running the household. (13) The government has spelled out measures to support working mothers, such as increasing the number of day-care centers for children. But also needed are steps to get men to play a greater role in child-rearing and household matters, rather than leaving it up to their wives. One major measure would be to eliminate the chronic problem of long working hours at many firms so employees can go home earlier. To this end, measures will be needed to change the mind-set of managers and employees alike — especially male workers. The government should take steps to support such efforts. (11) A top-down approach to promoting women to management positions may be necessary to change the situation. But equally important will be more steady bottom-up efforts to remove obstacles that discourage women from maintaining their career path. According to the labor and welfare ministry, women account for roughly 40 percent of Japan’s workforce, but more thanhalf of them are irregular employees, working part-time or as temporary dispatch staff. (10) Protesters stood outside the Health Ministry on Monday chanting for the resignation of Ana Mato, the national health minister. Facing complaints that the national government had acted too slowly, Prime Minister Mariano Rajoy created a special commission on Friday to oversee readiness and investigate how Ms. Romero became infected. (12) For now, Ms. Romero, 44, remains in critical condition, if showing tentative signs of improvement, housed on the sixth floor of the same hospital, Carlos III, where the two priests were cared for. (13) Her husband and 14 others are quarantined on a floor below, with none yet showing any symptoms of Ebola. In all, 83 people who came into contact with Ms. Romero are being monitored. (14) Beyond the uncertainty over how the infection occurred, much of the public confusion, and anger, is focused on the seemingly loose monitoring of Ms. Romero for more than a week after the death of the second priest. Even as she called in complaining of a low-grade fever and of feeling queasy, she was never told to return to Carlos III. (15) “She was considered a low-risk contact,” Dr. Fernando Simón, the Health Ministry official now leading the government investigation, said in an interview. (16) Ms. Romero’s own actions are being closely examined, too, to determine whether she put people at risk as her symptoms began to emerge. (17) Javier Rodríguez, Madrid’s regional health minister, initially blamed Ms. Romero for her infection, saying she also may have lied to doctors, remarks that drew angry criticism. He also later seemed to mock the importance of training workers to remove their protective suits. (18) “You don’t need a master’s degree to explain to someone how you should put on or take off” a protective suit, he said on a Madrid television program. (19) On Monday, Ms. Romero’s husband, Javier Limón, had a friend read a statement outside Carlos III in which he demanded Mr. Rodríguez’s resignation and defended his wife, saying she had acted precisely as she had been told to. On Tuesday, Mr. Rodríguez apologized. He(the friend) read a statement. (20) In Madrid, unions representing health workers have complained that too little training was provided on how to properly remove the suits, with some people being shown a 20-minute video and others saying they got no instruction. (1)　MADRID - The scene conveyed a First World precision: A 75-year-old Spanish priest, stricken with Ebola in Liberia, arrived in Madrid on a special military jet. A helicopter buzzed overhead as ambulances transported him for treatment. Expressing confidence in the preparations, a Spanish health official said the risk of the virus’s spreading was “virus's spreading was "virtually nil."? (2) There was just one problem: The city’s infectious disease center had been mostly dismantled as part of a government cost-cutting plan, and a temporary Ebola ward would have to be hurriedly constructed. (3) After the priest died on Aug. 12, the unit was closed again, and the same exercise repeated when a second Ebola-infected priest was airlifted from West Africa in September. He died two days later, and last week an auxiliary nurse who changed his diaper and helped clean his bed was found to have the disease. (4) That ad hoc, improvisational response to a deadly virus that has already killed more than 4,000 people in West Africa has underscored holes in the West’s readiness to confront a wider outbreak. The infection of the Spanish nurse, Teresa Romero Ramos, was the first case of the disease’s being transmitted outside Africa ? arising even before a nurse in Dallas was given an Ebola diagnosis after caring for a patient there.? How Many Ebola Patients Are Outside of West Africa? (5) Together, the cases have raised urgent questions about the risks of the disease’s spreading even in developed countries, particularly among health care workers, and the role that the smallest of human errors may play in subverting elaborate safety measures. ③and the role that the smallest of human errors may play in subverting elaborate safety measures. ③-1 (the cases have raised urgent questions about the risk of) the role that the smallest of human errors may play in subverting elaborate safety measures. (6) Both of the nurses had been wearing protective gear, which can pose extreme risks of infection if removed improperly. Officials are investigating whether the Spanish nurse may have inadvertently touched her face while taking her suit off. (7) A team of European Union investigators has found fault in the layout of the Ebola ward, while Ms. Romero’s co-workers have said they were forced to remove their gear in a very small space, with limited room to maneuver, even as temperatures rose quickly inside the suit. (8) “You are sweating more, and you are anxious to get it off,” said Manuel Torres, a nurse who joined Ms. Romero in treating the first priest and is now a member of the team treating her. (9) Recriminations in Spain, like those in the United States, have been loud and swift, with blame aimed variously at cost cuts, inadequate training and safety protocols, government officials, and the nurse herself. [Protesters] chanted for the resignation of Ana Mato. [Prime Minister] faced complaints that the national government had acted too slowly. (1) MADRID — The scene conveyed a First World precision: A 75-year-old Spanish priest, stricken with Ebola in Liberia, arrived in Madrid on a special military jet. A helicopter buzzed overhead as ambulances transported him for treatment. Expressing confidence in the preparations, a Spanish health official said the risk of the virus’s spreading was “virus’s spreading was “virus's spreading was "virtually nil." (4) That ad hoc, improvisational response to a deadly virus that has already killed more than 4,000 people in West Africa has underscored holes in the West’s readiness to confront a wider outbreak. The infection of the Spanish nurse, Teresa Romero Ramos, was the first case of the disease’s being transmitted outside Africa — arising even before a nurse in Dallas was given an Ebola diagnosis after caring for a patient there. (21) Without admitting any fault, health officials have sent work crews into Carlos III in recent days to expand the size of the changing areas used by health workers. On Tuesday they also announced that all health care workers would receive training courses from the military and Doctors Without Borders, the international aid group. (22) Unquestionably, the Ebola crisis has exposed the deep divide between health workers and Madrid’s government. In December 2012, Madrid officials announced a broad plan to cut costs by restructuring the public health system, privatizing some hospitals and closing two others, including Carlos III. (23) Unions vehemently protested the plan. Ultimately, Madrid officials canceled most of the program but still closed the infectious disease center at Carlos III so that the hospital could be converted for geriatric care. (24) By late last year, many doctors and nurses were reassigned to the adjacent La Paz Hospital, while the intensive care unit and other departments were dismantled at Carlos III. (26) By May, the spread of Ebola in West Africa was raising fears that the virus could reach Europe. Health officials in Madrid designated La Paz as the responsible hospital for any future cases, and staff members and hospital management soon revolted. (27) It is unclear when, precisely, Madrid officials backed away from that decision. Dr. Simón, the Health Ministry official, said the decision to take the infected priest, the Rev. Miguel Pajares, to Carlos III had been made in the final days before he arrived in early August. The sixth floor still had quarantine rooms but was otherwise empty, so equipment and furniture were quickly brought in. (28) That decision alarmed leaders of Amyts, the physicians’ union. Representatives from some other unions say the change was made at the very last moment. (30) Ms. Romero volunteered for the teams that treated both priests. As an auxiliary nurse, she assisted the nurses and handled some cleaning tasks. (31) When the Ebola staff disbanded, she left for time off. As a “low-risk” contact, she monitored herself, and was supposed to call in only if her temperature exceeded 38.6 degrees Celsius (101.5 degrees Fahrenheit). She did not initially demonstrate any symptoms and took a civil service exam on Sept. 27. (32) Three days later, though, she began to feel vaguely ill. According to Dr. Simón, she went to see a local physician on Oct. 2, though she did not mention that she had worked in the Ebola unit. The doctor gave her paracetamol for her low-grade fever. (33) That same day, Ms. Romero made her first call to the monitoring unit at La Paz, which was tracking the Ebola team. Her temperature remained below the 38.6 threshold, and she was advised to continue self-monitoring. (35) Finally, on Oct. 6, Ms. Romero called an ambulance service for the closest hospital, Alcorcón, warning that she had worked on the Ebola team and might be showing symptoms. At Alcorcón, she was quickly quarantined. (36) After seeing Ebola symptoms, the attending physician, Dr. Juan Manuel Parra, himself now under quarantine, made several requests that she be transferred to Carlos III. (37) Her transfer was delayed while health officials tried to find one of the special plastic capsules needed to move an Ebola patient, and while a medical team was scrambled to again prepare the once-empty sixth floor of Carlos III.